CALL NOW! Ask about our FREE Infrared Inspection! The use of SPF for wall insulation and foundation waterproofing and insulation in residential homes is growing quickly. This growth is due to the many advantages over traditional fiberglass and cellulose insulation systems. 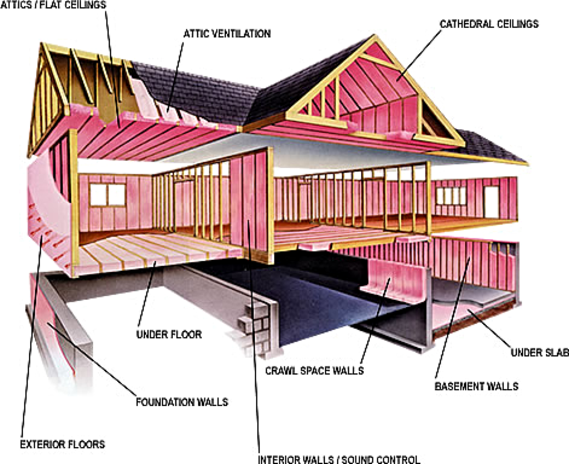 Spray Foam Insulation is the best and most advanced insulating material available for your home. It protects your family from airborne hazards, often lasts for the life of the structure, and saves you money in multiple ways. Make sure your new home has been insulated properly and up to date, with spray foam insulation. Due to the expanding nature of spray foam insulation application, your home will be sealed against dangerous pollutants, molds and mildews, even airborne pollutants and allergens. Other types of rolled or blown insulation can’t guarantee a seal like spray foam (SPF) insulation. This seal is essential to containing and isolating your internal climate, increasing system efficiency and lowering costs. SPF insulation can save you money on costly energy bills, reduce the chances of mold and mildew intrusion, and form a thermal barrier seal without extra cost. How does spray foam insulation (SPF) work? When mixed properly and under the right conditions, a two part organic resin chemical compound expands and hardens when introduced to oxygen. This mixture expands to 5-10 times its original size, rapidly filling cracks and crevices, creating an airtight seal on most construction materials. Studies have shown that structures insulated with SPF insulation see a 20%-40% reduction in energy usage for climate control. These savings depend on the buildings site, size, and amenities. Through energy savings alone, the cost of the SPF insulation system can be recovered in less than 5 years. Another aspect to consider is the long life of SPF insulation when kept away from UltraViolet (UV) light sources, such as sunlight. You can expect your spray foam insulation to last the life of the structure. Is Spray Foam Insulation as safe as I’ve heard? Applied properly, Spray Foam Insulation is as safe as any other insulation type. Your contractor will inform you of specific time limits on re-entering the premise. Your newly insulated house is now moisture locked to prevent mold and mildew from coming in and spreading inside your house, a dangerous situation for the home’s occupants. The spray foam insulation will also add to the strength of your wall overall. How ‘Green’ is Spray Foam Insulation? Worldwide, buildings account for over 40% of energy usage and contribute over 30% of greenhouse gases (Source US Energy Information Administration 2008). Spray foam insulation has been shown to reduce energy usage in buildings by 20%-40%. Reducing your energy consumption means reducing your carbon footprint, preserving the Earth for another generation.